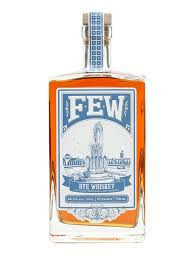 FEW Rye Whiskey is a rye whiskey from Chicago's FEW distillery, named for temperance campaigner Frances Elizabeth Willard. This is rye heavy, with a touch of corn in the mix. Aged in air-dried oak barrels, this is a spicy offering. FEW Rye American Whiskey has a perfect balanced of apples, pear and a little unripe banana, with a lingering finish of candied orange and spice. 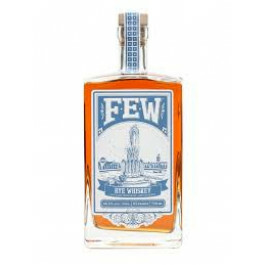 FEW Rye Whiskey is a rye whiskey from Chicago's FEW distillery, named for temperance campaigner Frances Elizabeth Willard. This is rye heavy, with a touch of corn in the mix. Aged in air-dried oak barrels, this is a spicy offering. FEW Rye American Whiskey has a perfect balanced of apples, pear and a little unripe banana, with a lingering finish of candied orange and spice.